IMPORTANTIf your studio uses a license server, you will need to upgrade it to Harmony 15 before you can upgrade to Harmony 15 on client workstations. License servers with Harmony 14 or earlier cannot be used to activate Harmony 15. Guides can be used to help draw backgrounds and objects with perspective by displaying vanishing points and axes in the drawing space and locking your drawing tool to them—see About Drawing Guides. This new drawing tools allows you to manipulate brush strokes as if they were pencil lines—see About the Centerline Editor and Centerline Editor Tool Properties. Autofill, Trim Extra Lines and Align Handle These new options in the Tool Properties view allow you to quickly fill and trim closed shapes drawn with the Pencil, Stroke and Polyline tools—see Pencil Tool Properties, Stroke Tool Properties and Polyline Tool Properties. Each drawing layer in the Timeline view can now display a thumbnail of the current drawing as well as of every exposed drawing in the scene, allowing users to easily manage drawings when doing paperless animation—see Displaying Drawing Thumbnails in the Timeline View. When the Timeline view is sufficiently zoomed in to view the thumbnails of exposed drawings, it is possible to extend or shorten the exposure of individual drawings either by overwriting or rippling the following drawings—see About Rippling and Overwriting the Exposure in the Timeline View. When thumbnails are displayed for a layer, the layer also displays an Opacity parameter which can be adjusted. 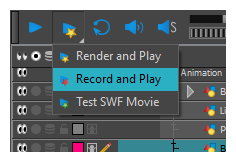 The new Record and Play command, available from the Play menu and Playback toolbar, quickly renders OpenGL frames, makes a video file and opens it in the workstation’s default video player for a quick preview of the scene’s animation with no framerate issues—see Playback Toolbar and Play Menu. 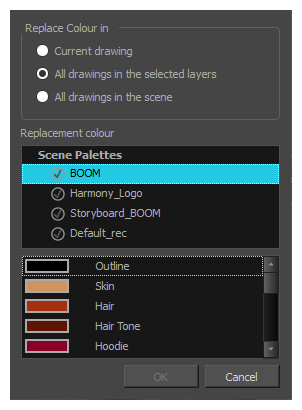 An option in the Colour view can be used to replace a colour or texture with a different colour or texture in the current drawing, all drawings in a layer or all drawings in the scene—see Replacing Colours and Textures in Drawings. Drawing layers now have a Matte connection, allowing you to use the shape of another drawing layer to cut out part of the drawing without using a Cutter effect—seeUsing the Matte Port of a Drawing Layer. Fixed performance issues when making large selections with the Transform tool. Fixed performance issues when the Xsheet view is in the workspace and has shared functions. Render preview optimization Frames rendered for render preview are temporarily cached so that they are not regenerated when switching between frames unless a change requires to generate a new render. Harmony supports Retina display on macOS workstation as well as High DPI monitors on Windows workstation with a scaling factor of up to 200%. Export in Windows Media Video on Windows On Windows only, Harmony can now export in Windows Media Video format. This can be used as an alternative to exporting in QuickTime movie format, which requires Apple QuickTime to be installed—see Exporting a Movie File . Audio support on Windows now relies on native Windows libraries instead of QuickTime. The colour list will now automatically scroll when attempting to reorder colour swatches below or above visible colour swatches. Moving the Timeline cursor now sets the frame selection to the current frame. Harmony will scale its own user interface for high resolution display. All other applications will be scaled passively by the operating system. Fixed issue where Render Preview would not update when moving a camera peg. Fixed memory leak when rendering in video format on Windows. Fixed issue where importing Flash assets would cause a drawing cut by a mask to be merged with the following layer, even if that other layer was not linked to the mask. Fixed missing file when attempting to export movie files that are bigger than 4 gigabytes, which was first found to occur when attempting to export in 4K resolution with the BlackMagic codec at 10 bit colour depth. Fixed crash when pasting artwork with grouped lines. Fixed issue with the Select Tool pivot does not stay in position with zooming in or out. Fixed crash when launching on macOS with the locale set to Korean. Fixed issue where lines got flattened when using the Select by Colour option of the Select Tool on scanned drawings. Fixed crash when importing and vectorizing images in Black and White in Spanish or Japanese. Fixed issue where dragging and dropping exposure in the middle of another exposure in the Timeline would override subsequent exposure. Fixed issue where dragging and dropping exposure in an empty area of the Timeline would cause loss of timing. Fixed issue where using the D disable layers shortcut when making a selection in the Camera view would not work if layers were collapsed or not listed in the Timeline view. Fixed issue where Cutter and Eraser tool options were not applied when using their temporary tool override keyboard shortcuts. Fixed issue where line thickness of a pencil line with a thickness of 0 could not be adjusted.